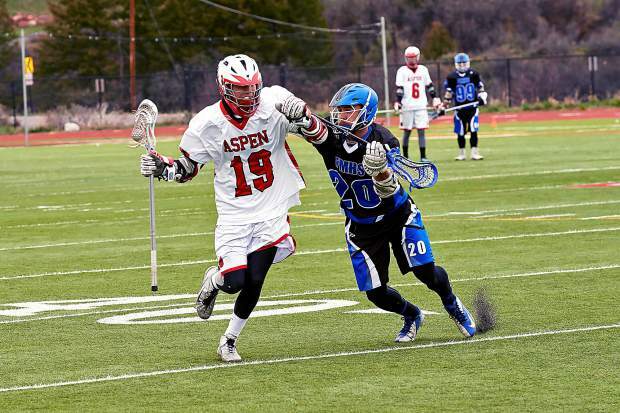 Aspen's John Heaphey holds off Fruita Monument's Jacob Lynch during Wedneday's Mountain League lacrosse game at AHS. Heaphey scored the opening goal in Aspen's big win. The Aspen High School boys lacrosse team celebrated the final regular-season home game of the season — and senior day — with a dominating 17-2 victory over visiting Fruita Monument on a chilly Wednesday afternoon in Aspen. 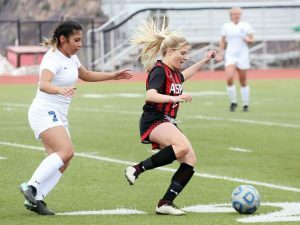 The Skiers unleashed their most prolific offensive output of the season, scoring a record 17 goals in the first half of the Mountain League game. “Our goal is to be at full intensity from the very first whistle of the game and on through the end of the game,” Aspen head coach Mike Goerne said. Harry Ferguson triggered the early scoring for the Skiers, who potted seven goals in the opening 12-minute period. 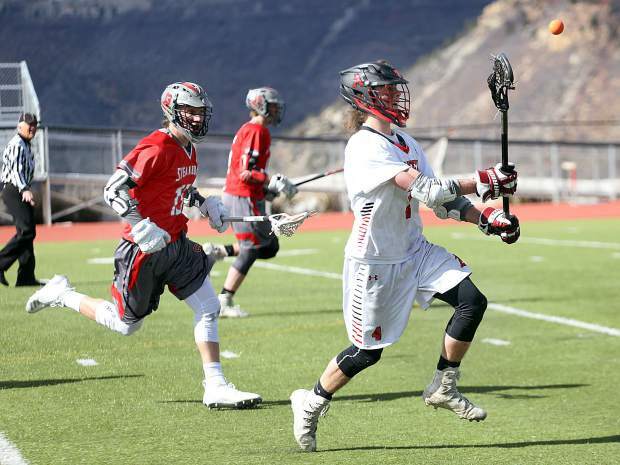 He passed from behind the Fruita Monument goal to John Heaphey, who ripped in the first of Aspen’s 17 goals. Ferguson assisted on two more first-period goals. Teammate Ryan Fitzgerald scored three consecutive goals. And Tyler Tick scored the first of his four first-half goals. All in the first quarter. Tick scored three in a row in the second period when Aspen’s precise passing and aggressive attacking took a heavy toll on the staggering Wildcats, who were beset by penalties. Jonathan Wells, Matt Sovich and Evan Morris added goals, and Ferguson scored twice in the Skiers’ most productive two periods of a season where they are 12-2 overall, 7-1 in conference play. 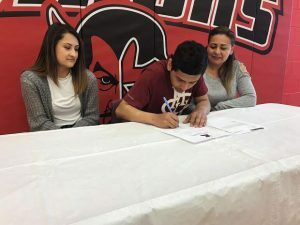 He said the Skiers did an excellent job with their discipline and composure in the win over Fruita Monument and Monday’s win over visiting Windsor. 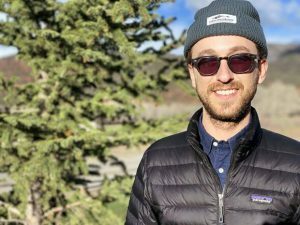 “It’s been a very good week for us,” Goerne said as the Skiers head to Steamboat Springs with an opportunity to throw the Mountain League into a three-way tie. “It’s always a tough situation to play on their field,” Goerne said, adding that the keys for the Skiers will be discipline, focus and team play. Steamboat Springs currently leads the conference with an unbeaten record of 7-0. The Sailors will play at Summit today before hosting the Skiers at 11 a.m. Saturday. 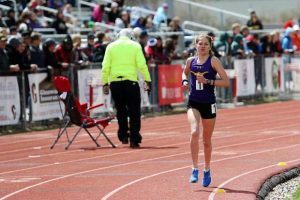 Battle Mountain, the conference team that beat the Skiers 7-5 in Edwards two weeks ago, also has one conference loss (to Steamboat Springs). Battle Mountain will host Grand Junction on Friday. Steamboat Springs currently is ranked No. 3 in the Class 3A chsaanow.com poll. Aspen is No. 7. Battle Mountain is No. 6.